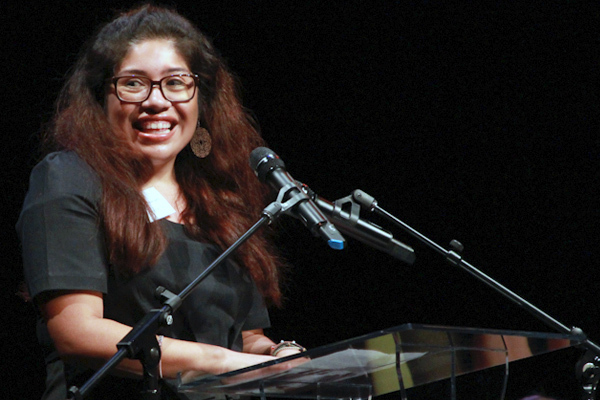 The 6th Annual WriteGirl Bold Ink Awards on November 5th were a huge success! The Eli and Edythe Broad Stage in Santa Monica was the perfect location for this memorable event, which included inspiring remarks by our honorees Melissa Rosenberg, Lisa Cholodenko, Kami Garcia, Margaret Stohl and Zoe Kazan. Guests mingled under the night sky and bid on an incredible selection of auction items, while enjoying an array of hors d’oeuvres and beverages from local restaurants. On the red carpet: presenters Chris Messina, Edi Gathegi, Tahereh Mafi, Ransom Riggs, Elizabeth Sarnoff, special guests Arturo Delgado, Ben Allen, Aasha Davis, Michelle Shocked and celebrity guests Trevor St. John, Molly Quinn, Janet Robin, Dawn Prescott and Toni Graphia. Honorees and presenters shared inside stories of writing challenges and successes, audience members sang along with traveling troubadour Michelle Shocked, actress Aasha Davis read a piece from WriteGirl’s newest anthology, No Character Limit, and WriteGirl alumna, Glenda Garcia, spoke about her journey from mentee to Fulbright Scholar. I was so impressed with this year’s Bold Ink Awards event, and all of the phenomenal work you have accomplished with WriteGirl. Very moving and powerful. I still can’t quite get over it.